Do you have a front door that looks a little sad? Maybe the paint is chipping, it is warped or it struggles to shut? We all need to replace our doors from time to time. If your door is a little worn down but you’re not sure if it really needs to be replaced, then consider a few factors relating to when it is a good time to replace your front door. Not sure if it’s time to toss the old front door? Deciding to replace a front door can come down a few issues, some of which are more than just deciding the door doesn’t look good anymore. For example, many people choose to replace their door because it isn’t energy efficient. The truth is that if you have an old door, it can be a serious energy leak. If you have an outdated door, now is the time to consider replacing it. If you think that a front door doesn’t have much of an impact on how your house looks, think again. 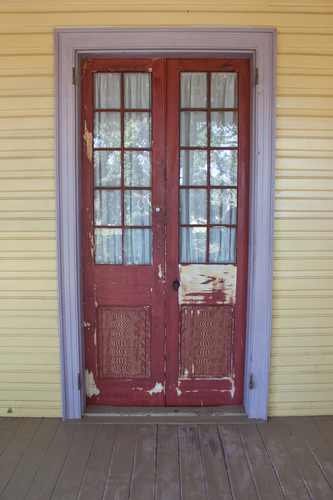 If a door is cracked, weathered, dented or faded, it can really affect how your house looks. Sadly, front doors often take a beating because of sun, wind, and excessive rain. Over time, these elements take a toll on doors and their look starts to decline. If your door doesn’t look good anymore, consider replacing it. This one simple change can have a huge impact on how your house looks. One of the most obvious signs that it is time to replace your door is if it isn’t working. Is it a struggle to get the door latched shut? Does it open and shut seamlessly? Does it catch or drag at any point, and are there any gaps around the door frame and door? Any problems with the functionality of the door probably mean that the door is warped. Extreme changes in temperature, bad weather and humidity all lead to door warping. Warped doors are frustrating to use and can be a drain on your energy bill. When you’re thinking about replacing your door, consider the weather and the time of year when doing your planning. Spring, summer and fall are all great times to get the door installed on a house. Being proactive and getting a door replaced before winter or summer means that the new door will help save you money in heating and cooling by improving energy efficiency. Door Perhaps one of the most important things to consider when replacing your door is the design. After all, the door is something you are going to be looking at every day for many years to come. You will want to pick a design that fits the aesthetic of your house and will make your house look attractive. The material you choose is important, too. One of the most popular choices is solid wood, while fiberglass and steel have started to grow in popularity. Steel and fiberglass doors can be painted to be any color and are secure and durable. To view Doors of Elegance’s extensive and beautiful selection of front doors, visit our gallery. Deciding when to replace your front door can be a tough decision. After all, you may wonder if your door really needs to be replaced and you may be overwhelmed at picking a new door. Our experts are available for a consultation if you would like guidance in finding the perfect new door to fit in with your home. Please contact us today with any questions!